With drier air, more time spent inside, and now the start of a new school semester, welcome to the peak of cold and flu season! Many remedies that alleviate cold symptoms are known to be hard on your teeth. Symptoms like a runny nose, sneezing, coughing, congestion, and fever all rely on decongestants, sugary cough drops, and syrups. These remedies sometimes make it difficult to protect the enamel on our teeth. Here’s how to maintain your best dental health as you fight off a cold or flu mitigating symptoms and remedies. Problem: In an effort to alleviate a sore throat or cough, drops and lozenges work by dissolving slowly in your mouth coating the scratchy, uncomfortable areas. Unfortunately, sugar is a common ingredient! Plaque bacteria uses sugar to produce acids that attach your enamel. So, drops and lozenges sitting in your mouth for long periods of time can result in tooth decay. Solution: Choose sugar-free drops and lozenges and brush your teeth often! Problem: Just like cough drops and lozenges, liquid cold medicine and cough syrup contain sugar, and sometimes alcohol. Again, plaque bacteria uses sugar to produce acids that attach your enamel resulting in tooth decay. Alcohol reduces saliva production, which makes it harder to wash this thick liquid away. Solution: Choose pills or gel-caps in lieu of liquid medication. If this isn’t an option, make sure to brush afterwards! Problem: Decongestants and antihistamines can help relieve a runny nose and sneezing when you have a cold. Unfortunately, dry mouth is a common side effect leaving the mouth too dry. Reduced saliva can promote bacterial growth, which contributes to gum disease and tooth decay. Solution: Chew sugar-free gum or sugar-free drops and lozenges to promote saliva production, brushing afterwards. Drink plenty of water to stay hydrated! Problem: Common home remedies for colds and flues include tea to ease symptoms, orange juice to deliver Vitamin C, and 7-Up for soothing the stomach. However, the acidity in orange juice, sugar in 7-Up, and staining-effect of tea can make these beverages hazardous to the teeth. Solution: Remember to brush after consuming these drinks and to use a straw to minimize contact with your teeth. 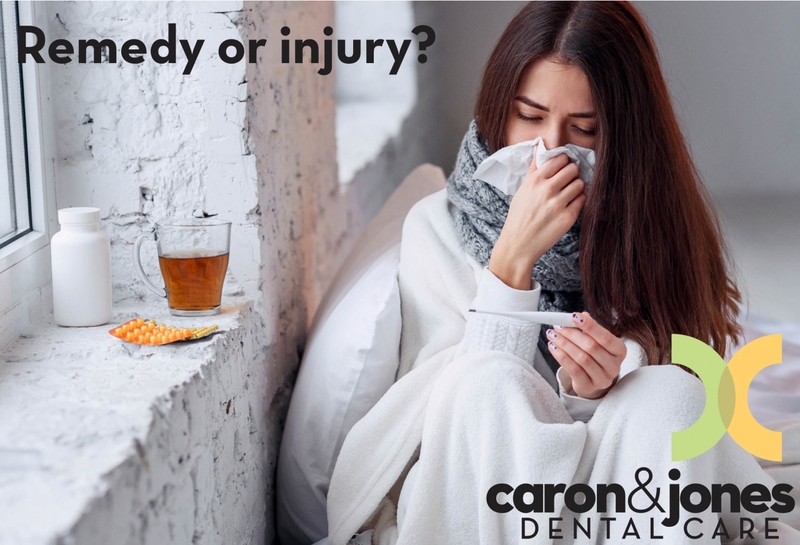 Knowing how to mitigate possible damage to your teeth while caring for your cold and flu symptoms is a great start! Brush a little more frequently, drink lots of water, and replace your toothbrush as soon as your cold or flu symptoms disappear will help keep you well and protect your teeth.